I love and enjoy reading all my bento books. I really learn a lot from my bento books. I don't mind to buy bento books even bento books in Jakarta are very expensive. Some of you will be surprised if I say that the price can be double from their actual price (Japanese Yen). Most of them I bought from Kinokuniya bookstore in Jakarta and Singapore. I forgot which one is my first bento book now. Although I can't read Japanese but all the pictures inside the books already tell a thousand words. 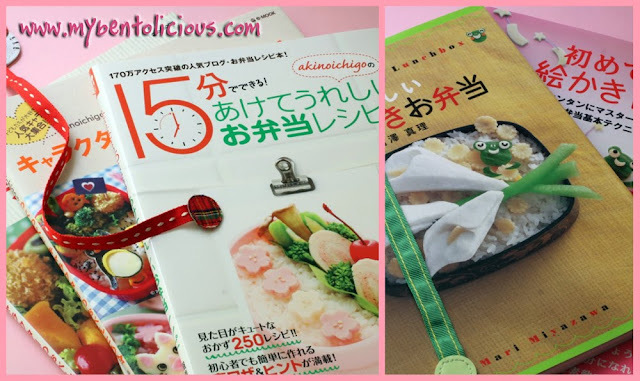 My favorite Japanese bento books are from Akinoichigo, Mari Miyazawa, and Kaeren Mama. Recently, I bought from Amazon my first bento book in English by Susan Yuen. Hope I can get Crystal Watanabe and Makiko Ogawa English bento book too later. I believe that read and learn from the book never bring any harms. A lot of reading can enrich our knowledge (IMHO). so I still keep them along with my bento books collection. WOW! So many bento books. I just bought one bento book from Kinokuniya at 20% discount storewide ....of course there are other books too, total cost more than one hundred dollars. Lia, no. of Japanese Bento Books you have really shocked me. It broaden my horizons. Wau!!!! Pocket bleeds... (荷包大出血) (n_n). I saw your title "Book #001", i though u wana introduce your 1st bento book to us.. and when i clicked in, i saw your picture, it really makes me 'WOW', your collections are marvellous.. Totally agree with you, although 荷包大出血 but you will gain self-satisfaction (^_^). Between, among the books, which book has more bread in it? Any recommendation? I am thinking to get one with more bread inside, as I only prepare light snack most of the time. @Vanessa : Unfortunately I can't find bento books that featuring much the bread bento. Although some bento books like Kaeren Mama, Akinoichigo, and Susan Yuen will have some pages featuring it. @shoppingmum : Amy, but you are so great with your bento. 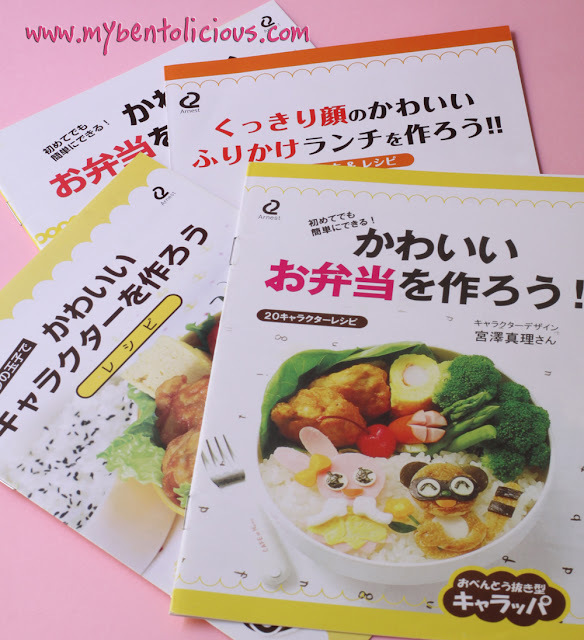 Do you find bento books easily in Bangkok? Wow! 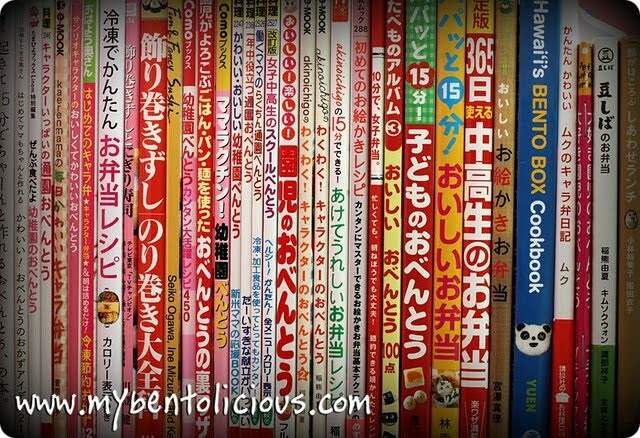 You have such a huge collection of bento books Lia! I'm yet to get one, must pay Kinokuniya in KL a visit soon! :) Hardly can find bento books in other bookshops. @Kids Dream Work : Thanks! Same here, only can get bento books in Kinokuniya. That is an impressive collection of books!!! I keep all of the little books from the cutters and things too, they have great ideas in them! WOW that's a lot of bento books! I love browsing bento books, it's always full of cutie stuff. Wow Lia, I wish I could go to your house and read your library! I don't have even a single bento book, wah! @mushima hawani : hehehe ... will be great to be your neighbour :) Thanks a lot Wani! What a huge collection! U made me interested in bento too, maybe I'll pick up a few from amazon next time ... yes amazon is definitely cheaper than kino!